On a monthly basis, lifeseek.org will be featuring a thought-provoking essay that is designed to stimulate healthy dialogue and a collective resolve to seek the face of God for answers of some of the most pressing issues of our age. Your participation and feedback is very important to us and we encourage you to leave your comments, facebook or tweet this post after reading. The Elementary and Secondary Education Act (ESEA) of 1965 was the government’s efforts to wage a “war on poverty”. It proposed equalized opportunities for all students, particularly those students coming from impoverished backgrounds, while also setting standards and accountability for students achievement. The original ESEA was passed and renewed every 5 years until the election of President Bush. 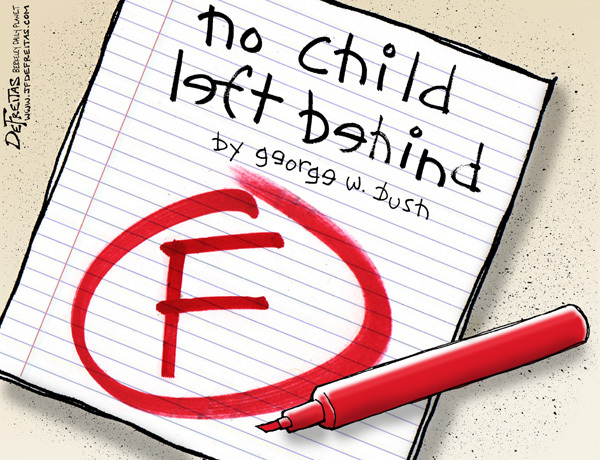 Under his tenure the act was renamed, “No Child Left Behind” (NCLB), and since then has sparked a whirlwind of controversy, turmoil, attacks, misunderstood language, and therefore, great conflict in the education arena. Everyone needs to be educated on what’s happening in, Education. “I can’t believe you won’t fail my kid because of this stupid, No Child Left Behind madness”, I comment made by a parent who thought the statute literally meant, kids could not be left behind. NCLB is in reality a LAW that was passed in 2001 that called for some educational reforms; probably some of the most aggressive reforms we’ve seen in years in America. One over-arching way to describe NCLB is “standards-based education reform” , meaning that we will set high standards and establish measurable goals to improve students achievement in schools. It does NOT state that students cannot be left behind . . . in fact, NCLB requires that schools keep track of those statistics because it is of growing importance that students be progressing so that they are NOT left behind. The downside to NCLB can be discussed for decades to come, so I will only highlight a few examples. First, the thought of using both incentives and sanctions to motivate schools to improve is a bit over-rated. In their book, NCLB Meets School Realities, Sunderman, Kim, and Orfield state that many teachers, “believe that the NCLB sanctions were unfair” adding in a study conducted in Fresno, California and Richmond, Virgina, that teachers overwhelmingly agreed that the sanctions would unfairly punish teachers. In Fresno and Richmond schools where schools were not making Adequate Yearly Progress (AYP – yearly growth and progress on standardized achievement tests), teachers agreed that sanctions were unfair with a percentage of 73.9% and 60.7% respectively. In schools where students WERE making AYP, teachers agreed that sanctions were unfair with a percentage of 80% and 64.1%. This raises the issue of (and a popular buzz word) accountability for teachers and schools. I don’t think there are many teachers around who don’t want to be “accountable” for their work; that is if the “average” teacher is serious about educating children. However, accountability, as it were, does NOT measure factors that are out of the control of teachers. In the same study mentioned above, teachers in both Fresno and Richmond felt that teacher’s needed more time to collaborate with other teachers, curricular and instructional materials that were aligned with state standards, and more money for those materials. Additional issues that are not measured by AYP statistics are the amount of students who are disenfranchised when they go home, the number of students whose parents cannot help them with homework, the amount of students whose home situations are not a suitable learning environment, or the number of students whose only safe haven IS the school that they attend. Finally, another key “con” of NCLB is the fact that a good portion of a districts AYP status hinges on their performance on “high stakes” testing. They are referred to as “high stakes” because they are given ONE time per year and there is a lot riding on whether or not students pass these assessments. Nichols, Glass, & Berliner state in an article that, “there is no convincing evidence that the pressure associated with high-stakes testing leads to any important benefits for students’ achievement.”  Nichols et. al, also declare that, “any problems associated with high-stakes testing will disproportionately affect America’s minority students.”  These high-stakes assessments are typically given in March or April to determine if students have made adequate academic gains over the course of a school-year. How odd though, that the assessments are given before students FINISH their instruction for that year! This causes many districts to “cheat-up” by teaching concepts that will be on the test, but do not show up in the curriculum until after the test. This is called, “teaching to the test”! The downside? If a concept on an April assessment is not taught until April or May, the teacher has to then find time in their normal daily schedule (usually social studies or science time) to fit those concepts into their instruction. This creates what the Center on Education Policy (CEP) calls “narrowing the curriculum”. In a study conducted in 2007 the CEP discovered that over 44% of districts reported “cutting time from one or more subjects or activities at the elementary level (social studies, science, art & music, physical education, lunch and/or recess) to devote more time to reading and math. And they say school isn’t fun!?!?!?!? Pros in different Area Codes . . .
It’s easy to sit back and dissect NCLB and the reforms in started because we hear about the “bad” stuff more regularly than the good. What are some of the positive points of the program (that’s an alliteration by the way). The National Education Association, along with their efforts to reform the NCLB reform, themselves to not totally discount the act in and of itself. They state in reference to NCLB that, “it’s stated goals – to improve student achievement and help close the achievement and skills gap that exist in our country – are important to NEA and our society.”  One of the major benefits of NCLB is that it required districts to show disaggregated data; that is, data that broke students into “subgroups” or “student groups” based on various categories such as, “African-American”, “Asian”, Economically Disadvantaged, “IEP (learning Support), and Latino (to name a few). Sunderman et. al, assert that, “each subgroup must reach the state-defined proficiency level in reading and mathematics.” The basic message to districts was simple, though the “holistic” district data may say we’re making appropriate academic progress, NCLB forced districts to look at specific groups and to become accountable to those groups. It would be very easy for a district (pre-NCLB) to show 80% of their students scoring at proficiency, however, if 12% of their population is made of up minority students who are failing, you would be none-the-wiser without looking at disaggregated data. This is a MAJOR step in “closing” the achievement gap, for one must truly face the “brutal facts” represented in the data, thus identifying the problem so that it can be addressed. 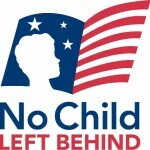 Jamie Horwitz, a spokesman for the American Federation of Teachers states of NCLB, “Overall, we are supportive of it . . . we like the professional development component, the emphasis on reading, Title I . . . we think it will have a positive affect.”  NCLB has caused many Americans to focus on education in an unprecedented manner . . . teachers are no longer just people in the classroom; instead they are professionals who have mastered a craft, a craft that should be fostered and developed like any other profession. Additionally, the emphasis on basic skill attainment and supporting students who come from “disadvantaged” socio-economic backgrounds are also important factors that weigh-in on NCLB’s intent. Another positive point of the act is that teachers be “highly qualified”, that is to say that they have attended a certified teacher preparation program and received state certification by passing a series of assessments as set forth by their respective states. This makes sense, right? I mean, would you let a doctor perform open heart surgery if he/she failed Anatomy and Physiology? Of course not! So why would we let a teacher instruct students having not passed the same level of rigorous assessments to show that they too, are qualified to do so? No one can prescribe a CURE-ALL for education; it’s virtually impossible to say that NCLB will work for all students, because it won’t. Nor is it fair to say that it’s completely bad and won’t work for any of our kids. One of the things we’ve learned over the course of time is that EVERYONE learns differently. Children process information in various ways, and therefore, a one-size fits all approach cannot work for the millions of children being educated in America’s schools. 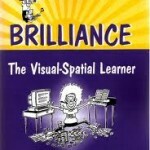 Dr. Linda Kreger Silverman, in her book, Upside-Down Brilliance: The Visual Spatial Learner gives characteristics for two types of learners, visual-spatial and auditory-sequential. The latter is described as, “the model student, they listen well. They understand what they hear. They follow directions. They learn to read [on schedule], they turn in homework on-time and you can read their handwriting. They learn in a step-by-step fashion- does this sound like you or your child? Niece? Nephew? Or Student? 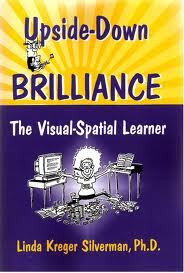 Contrariwise, she describes visual-spatial as, “creativity, facility with computers, visualization skills, and the ability to “see” and solve problems from many different perspectives.” These students are often poorly organized, seen as “different”, with sloppy handwriting, poor spelling, and an inability to do things in a step-by-step fashion. Sound familiar? Silverman asserts of our current education system, “Education as we know it is about the development of these auditory-sequential skills and it is well-suited for auditory-sequential learners . . . we do [this] job well.” The very etymology of the word “education” comes from the Latin word “educare” which literally means to draw out or to lead out. Therefore, education, in its purest sense means to draw out that which is already in someone or to lead someone into the discovery of learning. No amount of testing, money, or reforms can make us realize that we’ve left the basic understanding of what education was meant to be. So how do we move forward? No matter what reforms are instituted, no matter how many politicians give speeches regarding education reforms; it always starts in the home. Parents start the process of drawing out with their children and it’s a beautiful process. Babies begin to discover, as their sight develops they see and process new things; they begin to grab, feel, hear, taste, and explore their senses. It is during this time where they begin to make sounds which eventually turn into speech; they begin to walk and explore their surroundings and environment. It all starts in the home! Have you ever seen a parent yelling at their child to “sit down”, or “don’t put that in your mouth”, or hear a parent say, “this child is too busy”! But these natural developments are what mold and shape the minds of our children, through playing and exploration. Home is where schooling begins, it is where the process of education is rooted and it should grow from there. 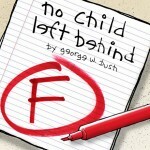 President Obama said of parenting, “Parents if you don’t parent, we can’t improve our schools . . . you’ve got to turn off the television set in your house once in a while, you’ve got to put the video game away once in a while.”  Though these comments upset many people who can argue with their validity? I hope that as we attempt to move forward with the improvement of our education system that we truly take a look at ALL of the factors that affect our kids. We will only see opportunities for real change when we look at the whole picture and as Jim Collins said in his book, From Good to Great, truly “face the brutal facts.” Only then, when reality is faced can we make REAL changes. 1) What are some of the strengths and weaknesses that you see with our education system? 2) Who should take responsibility of children are failing? Parents? Schools? Both? And why? 3) Since NCLB is the reauthorization of the ESEA of 1965, do you think it is out-dated? If so, what new and innovative ideas should school systems implement to better serve our children? V.J. Delos was born in Philadelphia, PA to J. Johnson and H. Johnson. After years of being raised in a Christian household V.J., soon realized the importance of a personal relationship with Christ. God soon moved individuals into his life who were able to teach him how to study the word and the importance of the fellowship of believers. After attending Temple University and graduating with a degree in education he quickly became and advocate for children. V.J. quickly discovered his talent and passion for teaching, music, & spoken work and seeks to use these gifts to glorify GOD. After some life-changing events V.J. has an unwavering desire to serve GOD, fellowship with His people, and to provide young people with the oppportunities to maximize their potential. Recently receiving his Masters Degree in Education Administration, V.J. Delos currently works as an elementary school administrator. His love for youth, desire to serve his school community, and passionate pursuit of a lifestyle rooted in integrity is what drives him on a daily basis. His life’s mantra, as was that of his late mother is that, “This too shall pass”. No matter how hard life gets, GOD sees the provision that he’s already given by his Grace to see you through it . . . With this in mind, V.J. Delos is sincerely desires to serve GOD and the people of GOD with joy, humility, and love. It does have to start from the home when it comes to education. One of the issues that is dealt with at my church is that a lot of kids do not have that same structure at home growing up as many of us had in our lives. A lot of young kids in the inner cities have lost hope because they have allowed what is happening to them externally control them internally, which is easy given the circumstances that they are in. No one education system will ever be perfect, and I do agree that everyone has a different way of learning. I have learned more by doing my own research and writing case studies then I have on reading and taking exams. Maybe if there was some way to identify how children learn best then have a system in place, or even a hybrid, where the children have the option to learn by doing and listening? The book you referenced from, Jim Collins Good to Great is an Excellent book! Good to see your material to be well researched and shared. E32crew, first thanks for your thoughts in regards to the article. You bring up some interesting points . . . I think most of us would agree that it starts in the home. I think schools do a good job of identifying students' learning styles, however, the resources (in most cases) are not there to approach it in an effective manner. For example, if you find a group of students who learn best with hands-on projects (bodily-kinesthetic), cooperative learning (interpersonal communication), and visual activities (visual-spatial), then ideally those students should be placed in classrooms where the teacher is adept at engaging students THROUGH learning experiences utilizing those styles. There are some models where students learn by doing such as the Maria Montessori schools, which are known for their unique approach to educating children. However, Montesorri teachers require special certification in addition to their undergraduate education, and they are far and few in between. Like many situations involving public services, money plays a significant factor, but should not have the final say in whether or not children have ample opportunities for success. Thanks again for your response to the article; we appreciate you sharing your thoughts. Orreccschools, thanks for your reply and your insight. You delve deeper into the “at home” struggle that most schools are dealing with, both locally, and nationally, particularly in America. The old addage, it takes a community to raise a child is SO true, however, our communities, whether they be our family base, our churches, or our literal live-in communities are so bogged down with 21st Century living, that our children do suffer from lack of adequate support, love, and nurturing. There are so many cultural nuances and implications that we could probably discuss for years . . . but my philosophy is, complain about something 5% of the time and use the other 95% coming up with potential solutions. I would therefore pose the question, that in light of these cultural and systematic realities, what can WE do to help our kids be successful individuals? Thanks again for your comment and I look forward to continued correspondence. Hey Orreccschools, Can you provide more information about your organization? do you have a website? Thanks for the reply. Feel free to email us at lifeseek@gmail.com..